A satisfying combination including tangy cranberries and cherries, and crunchy cashews and almonds. 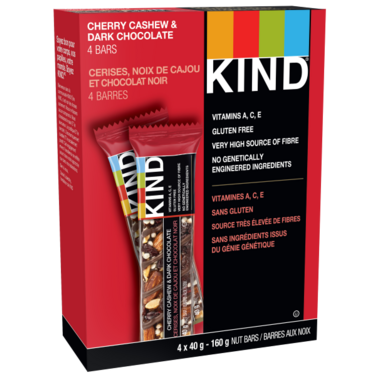 KIND® bars are all about simplicity. These bars include whole nuts bound in honey that make this a snack that’s easy to recognize, pronounce and enjoy. What’s not to love? Ingredients: Dried cherries (cherries, sugar), cashews, inulin, almonds, peanuts, dried cranberries (cranberries, sugar), honey, palm kernel oil, sugar, glucose syrup, crisp rice (rice flour, sugar, salt), raisins, cocoa mass, cocoa powder, soy lecithin, sea salt, natural flavour, cocoa butter, Vitamin A (Vit. A Acetate), Vitamin C (Ascorbic Acid), Vitamin E (D-Alpha Tocopheryl). Contains cashews, almonds, peanuts and soy. May contain tree nuts, sesame seeds, nut shell fragments and pits. Great for my purse as an emergency snack. I wish all their flavours have low sugar, 4-5 gr. Delicious!!! Wish they sold them in larger packages- 4 just doesn't seem enough lol. Pricey but worth it for a special sweet treat!